Horseback riding is a dangerous sport. The speed, height, and unpredictability of a horse, along with obstacles in arenas, rings and on trails combine to make riding one of the most dangerous sports there is. Statistically, you’re more likely to be hurt by a horse or riding accident than in motorcycling. The safest way to learn to ride is with an experienced coach on a quiet school horse. It’s not a great idea to try and learn to ride exclusively by reading a book, viewing a video or looking through a website. An instructor can teach you safe riding skills like stopping and turning, and how to cue for transitions between gaits. Instructors can you stop bad habits before they start and prevent you from making dangerous mistakes that could cause injury to horse, rider or onlooker. Make every ride as safe as possible with these basic guidelines. Ride a suitable horse for your riding skill level. Beginner riders should ride quiet, well-mannered horses used to the mistakes beginners make. The safest way to learn to ride is with an experienced riding instructor or coach. Don’t go it alone. Not only will you learn faster, you will be safer as you learn. If you are riding a young, green or unfamiliar horse, ride with supervision and in a familiar area. Taking a horse out on the trail, or riding alone for the first time isn’t a great idea. Wear an ASTM approved riding helmet. Numerous agencies and safety committees cite that the majority of rider fatalities are due to head injuries. Experienced riders are just as prone to head injuries as inexperienced. 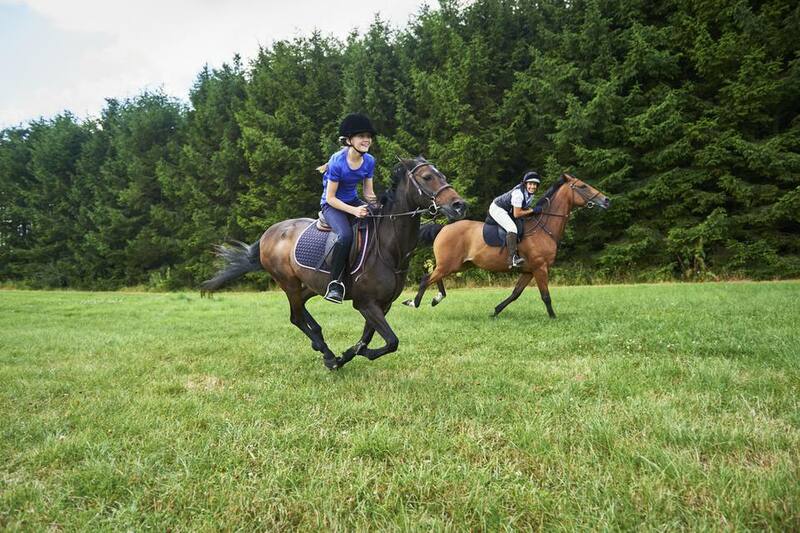 Some statistics suggest experienced riders are even more likely to be injured than beginners. Put on a helmet each and every time you ride. When riding in a group, keep at least one horse length between horses. Should one horse kick out at another, they’re unlikely to be able to make contact and won’t kick you by accident instead. If your horse becomes very agitated, dismount and handle the situation from the ground. Consider wearing torso protecting safety vest. Check your girth before mounting. Learn to do an emergency (one rein) stop. Learn how to fall. This won't guarantee you won't get hurt, but you may learn how to avoid injury by rolling away from the horse. Learn to do an emergency dismount. Sometimes the safest strategy is to get off quickly. Wear sturdy boots with minimal tread and a 1 inch (2.5 cm) heel. Alternatively, use safety stirrups or cages. If you fall you could be dragged if your foot slips through a stirrup. Always ride in complete control. As with cars or bikes, the faster you go the faster things can go wrong. Leave a map of your route when riding out on a trail and the approximate time you will return. That way the folks back home will know when to start worrying and where to look if you are overdue. Always ride out with a buddy. As an extra precaution carry a cell phone or two-way radio. A great number of accidents happen along roadsides. Avoid riding along roads where cars and other vehicles may spook your horse. In a group, ride the speed and to the capabilities of the least experienced rider of the greenest horse..
Don’t ‘run’ your horse home. Walk the last half mile at least. This prevents a bad habit of rushing.